The quantity of fat in the diet is a serious health issue for most Americans. While the Institute of Medicine recommends you limit fat to 20 percent to 35 percent of your daily calorie intake, the average American consumes more than this. On the upside, the right types of fat in the proper amount benefit your health. You may have heard of the health benefits of omega-3 and omega-6 fats. Another class of fats, omega-9s, are also beneficial. Oleic acid belongs to this category of fats, and it's relatively easy to get it in your diet. Oleic acid is a monounsaturated fat commonly found in vegetable oils and animal fat. While a diet high in saturated fat can increase cholesterol in your blood, eating monounsaturated fats in moderation can help reduce bad cholesterol and lower your risk of heart disease and stroke, according to the American Heart Association. Oleic acid is the primary fat in vegetable oils such as olive, canola and sunflower. Oleic acid is also found in nut oils, meat, poultry, cheese and foods made using oleic acid-rich vegetable oil. Some vegetable oils are specially produced to contain very high oleic acid content. You may notice oils labeled "high-oleic acid" at your local grocer. For example, high-oleic sunflower oil is typically composed of at least 80 percent oleic acid, according to the National Sunflower Association. It's crucial to choose healthy food sources of oleic acid, since it's found in a wide variety of foods, some of which aren't necessarily health-promoting. Oleic acid sources that contribute to the highest intake in the American diet include grain-based desserts, chicken, sausages, nuts, pizza, burgers, beef, eggs, regular cheese, potato chips, salad dressing, dairy desserts and yeast breads, according to the Center for Nutrition Policy and Promotion. Not all of these foods have stellar health profiles. So getting oleic acid from some of these sources may do more harm than good, since you'll also get excess calories, saturated fat and refined sugar in the process. 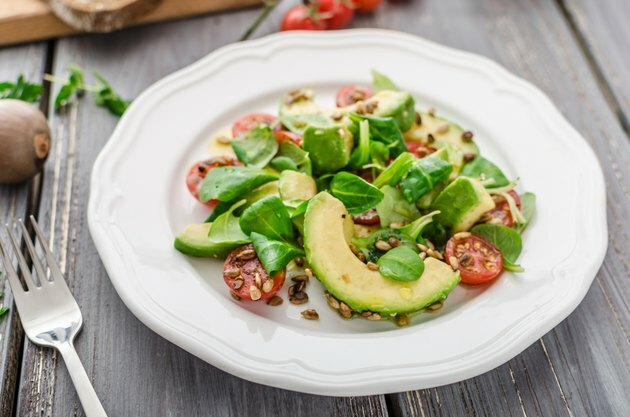 If you're looking to replace saturated fats in your diet with healthier fats, such as oleic acid, stick with natural, whole food or minimally processed sources such as a variety of nuts, seeds, avocados and cold-pressed vegetable oils such as safflower, almond and sunflower. You can easily add a handful of nuts to yogurt, smoothies and protein shakes or have them as a snack between meals. You can give crunch to salads by adding seeds or include them in your trail mix as a snack. Use oleic-acid rich oil on your salad in place of traditional dressing, or drizzle oil on your salmon or other protein as finishing oil. You can also use oleic-acid rich oil in your marinades.